What is the TODAY Function? The TODAY function is categorized under Date and Time functionsFunctionsList of the most important Excel functions for financial analysts. This cheat sheet covers 100s of functions that are critical to know as an Excel analyst. It will calculate and give the current date. It is updated continuously whenever a worksheet is changed or opened by a user. The function’s purpose is to get today’s date. As a financial analystFinancial Analyst Job DescriptionSee a real Financial Analyst Job Description including all the skills, experience, and education required to be the successful candidate for the job. Perform financial forecasting, reporting, and operational metrics tracking, analyze financial data, create financial models, the TODAY function can be used when we wish to display the current date in a report. It is also helpful in calculating intervals. Suppose we are given a database of employees, we can use the function to calculate the age of employee as of today. The TODAY function requires no arguments. However, it requires that you use empty parentheses (). The function will continually update each time the worksheet is opened or recalculated, that is, each time a cell value is entered or changed. If the value doesn’t change, we need to use F9 to force the worksheet to recalculate and update the value. How to use the TODAY Function in Excel? When we open this worksheet on a different date, the formulas will automatically update and give a different result. Let’s now understand how we can build a data validation rule for a date using the function. 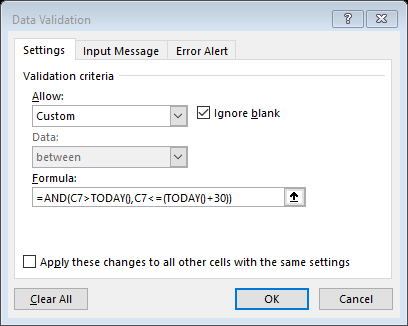 Suppose we wish to create a rule that allows only a date within the next 30 days, we can use data validation with a custom formula based on the AND, and TODAY functions. If we try to input a date that is not within 30 days, we will get an error. Data validation rules are triggered when a user tries to add or change a cell value. B3>TODAY() – It checks that the date input by a user is greater than today. B3<=(TODAY()+30) – It checks that the input is less than today plus 30 days. Excel stores dates as sequential serial numbers so they can be used in calculations. By default, January 1, 1900 is serial number 1, and January 1, 2018 is serial number 43101 because it is 43,100 days after January 1, 1900. Hence, we can simply add the number of days as +30 to the TODAY function. If both logical expressions return TRUE, the AND function returns TRUE and the data validation succeeds. If either expression returns FALSE, the validation fails.